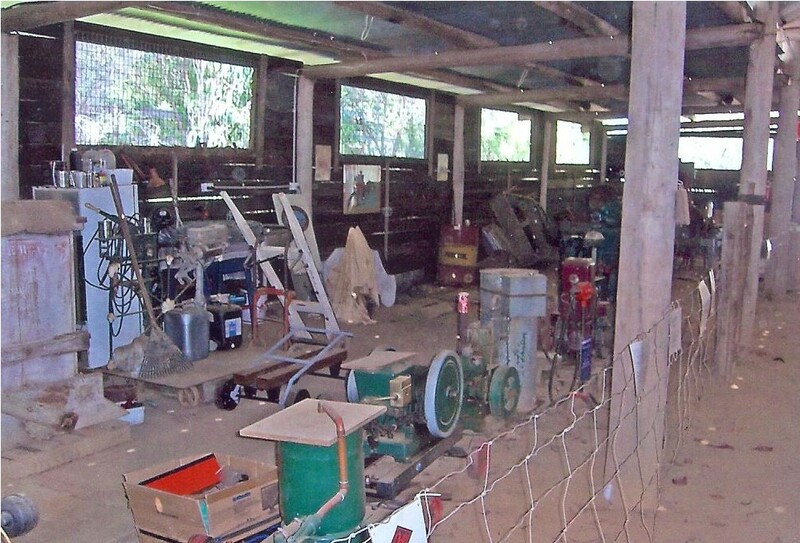 HQ's new floor - Moruya Antique Tractor & Machinery Assoc. 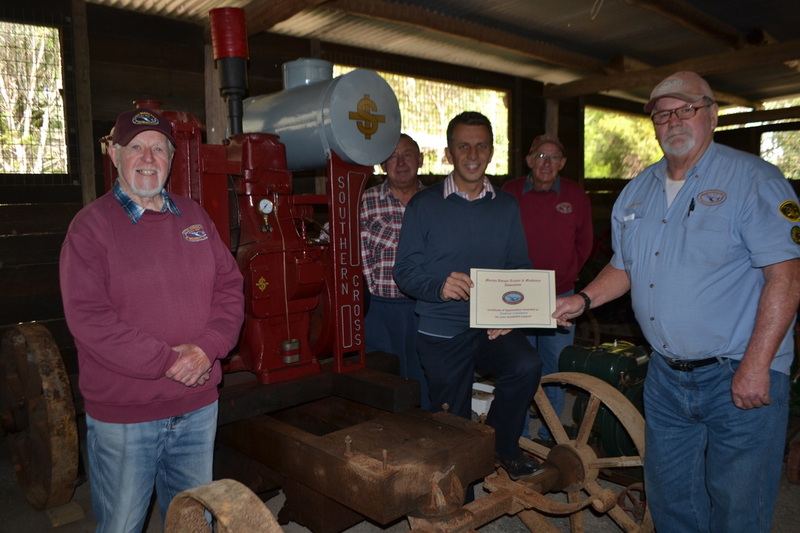 Inc.
Bob McColl presents our local member and State Treasurer, Andrew Constance, with a Certificate of Appreciation for his assistance with the grant. 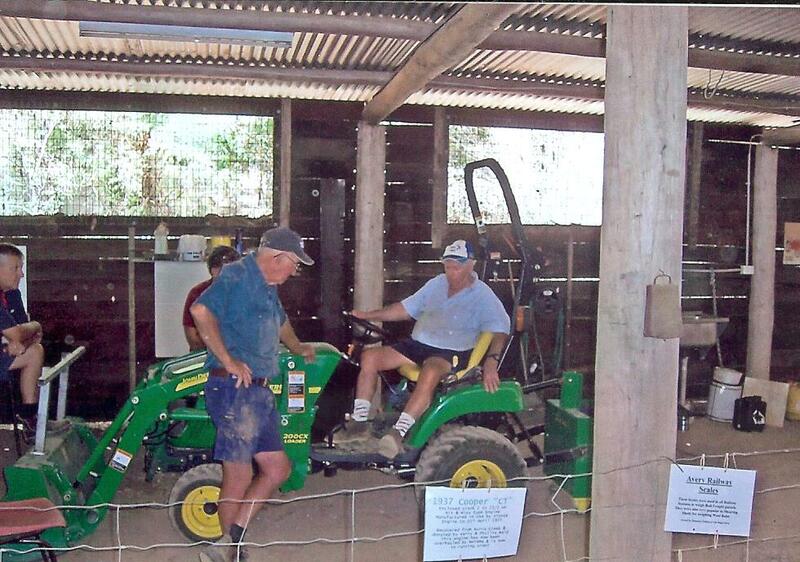 Also in the pic are Barry Hickson, Dave Hartwig, Mal Hill & our recently restored Southern Cross engine. Photo courtesy of "Bay Post"
Dust doesn't mix at all well with vintage machinery and our headquarters at "Old Mogo Town", had lots & lots of dust. It was constanty covering our machinery, getting into moving parts and causing damage. 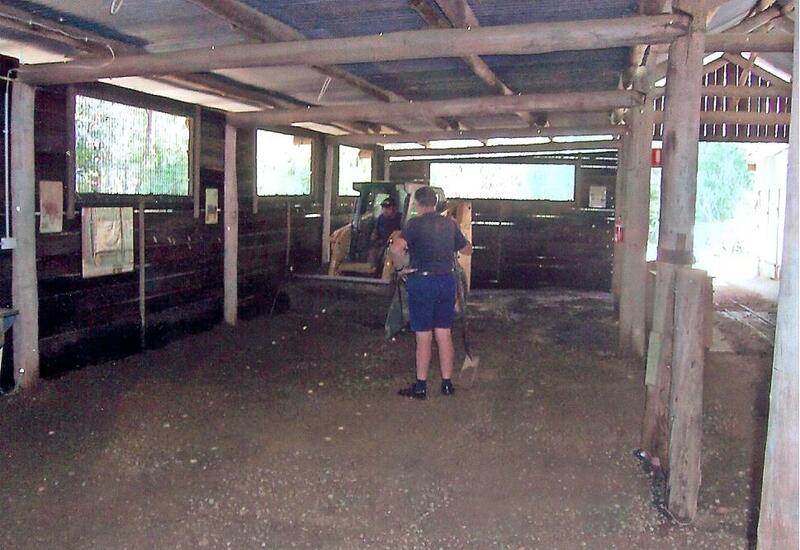 It was also pretty unpleasant for any members of the public interested enough to take a stroll through the shed. It had been a problem for many years. 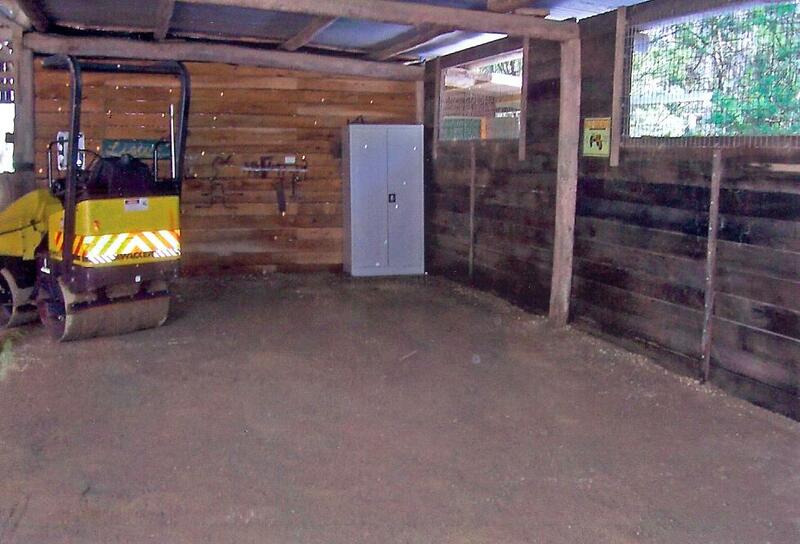 Something had to be done and recently, one of our members, Bob McColl, with computer/interweb assistance from Rob Patterson, was successful in securing a State Government "Community Building Partnership" Grant, designed to suppress the dust levels in the shed. It should be noted that throughout the application process, we had great support from our local member Mr. Andrew Constance and his able staff members. The securing of the grant was just the beginning, as it meant that much hard work lay ahead. The entire contents of the shed had to be removed, protected from the elements and stored in the back yard for the duration of the job. As the MOO's only meet on Tuesdays, it took 3 weeks until the shed was completely empty, clearing the way for the next stage of work to proceed. 52 tonnes of Decomposed Granite was brought in and spread by Bob-Cat with the team doing the final raking. Being well watered and compacted using a 2 tonne vibrating roller meant that it was going to be well packed down. Once everyone was satisfied with this stage, a further 11 tonnes of Crusher Dust was spread over the top to a depth of about 1". It too was watered and rolled to a smooth finish. Some engines have been running on the new floor, and the motion of the running engines has had no effect on the floor, so we have finished up with a very good surface for operating machinery. After some delays, due to bad weather, work started on the big job of putting all the engines and farm machinery back in the shed. At this time it was decided to alter the layout of the shed a little, and now, all the farm Machinery is on one side, and the engines and pumps on the other. This layout is far more pleasing. The final bits and pieces were put in place and the massive job is now complete. As mentioned earlier, our local member, Andrew Constance was of great assistance in securing this grant, so it was vital that he see the finished job. With his elevation to the position of “State Treasurer”, and after three false starts, we finally got him to come down to see where and how the money had been spent. Like most politicians his time is valuable and consequently we only got him for about half an hour. He was genuinely interested in what we are about, and asked a lot of questions. Before he left, Andrew promised he'd be back and as the son of a farmer, he requested that when he does return, that some of the engines be running. He was well and truly assured that it would be our pleasure to do so. This job would not have been completed without a very special effort from our members, (both old and new) and they all should be very proud of the outcome. The images above show the shed before work started with dust EVERYWHERE. 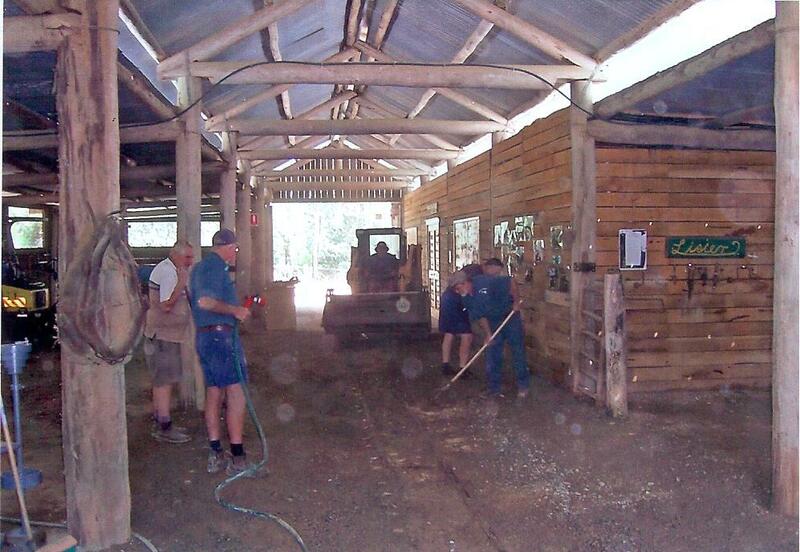 The other pics show the members moving the machinery out, the laying, spreading and the compacting of the new floor. Click on any image to see the bigger picture.